Oscar and Johnny met back in March 2012 through a mutual contact in the wine trade. Both shared a passion for aged Riojas and felt that there was a market largely unexploited internationally for these beautifuly made wines, relatively unknown to the outside world. They came across a treasure trove of over 100,000 bottles of perfectly cellared Riojas, vintages from 1964 through to 1995 and in the run up to Christmas 2012, sold the entire collection overseas. From this moment on they never looked back, their friendship, trust and respect for one another grew and in 2013 they teamed up to create Fine Rioja Wines. Today, the Company holds an extensive stock of over 12,000 bottles in our temperature cotrolled premasis in Rioja. We hope you enjoy the website and will share in their passion for the hidden secrets of Rioja! 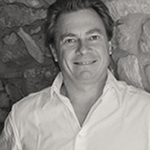 Johnny's career in the wine trade started in London in the 1980's. Fresh out of school, he worked for a leading UK merchant selling Bordeaux and Burgundies to the London Hotel and Restaurant trade, going on to attain his Higher Certificate Degree with the Wine & Spirit Education Trust. Johnny later left the wine trade and moved to Madrid in 1995 where he was appointed managing director for an international luxury brand group operating out of Spain. 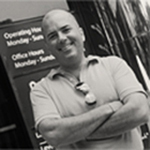 In 2005 he moved to Barcelona where he is now based and made his return to the wine trade in 2010. In 2013 Johnny joined forces with friend Oscar Alegre and the company Fine Rioja Wines was created. Johnny lives in the hills outside Barcelona with his Chilean wife and two sons. Oscar was born and raised in La Rioja. He studied as an Agricultural Engineer and worked in this field for two years before opting at the age of 26 to dedicate his time fully to his true passion, the world of wine. After completing his studies as an enologist in Italy, he returned to Rioja were he did a Masters in Winery Management. Oscar went on to work for Alvaro Palacios as export manager for almost 9 years and it is thanks to Alvaro that he developed his passion for fine wine. It was in 2010 after tasting a magnificent bottle of Honourable 1964 by Gomez Cruzado, which in part was made from vines that belonged to his family in Fonzaleche that he decided to devote his time to the mature wines of Rioja. Chris has been a permanent resident in Singapore for 15 years where he lives with his wife Sam, persuing a career in the corporate sector. In 2012 he the left the world of finance to set up some of Singapores most reknowned cafés and restaurants. Chris has connections in the world of food and beverage throughout Asia and has been actively representing Fine Rioja Wines interests over the past three years. In 2016 we are delighted to anounce the formation of Fine Rioja Wines Asia Pte Ltd.
We also remind you that the sale of alcohol to people under 18 years old is not allowed by law.